Fire up the barbie and get an Asian twist going on with these barbecued king prawns in a black pepper sauce. 1. For the black pepper sauce, toast the peppercorns in a pan over a medium heat for 1 minute, then grind roughly using a mortar and pestle, and reserve. 2. Pound the garlic and chilli using a mortar and pestle. Fry in oil in a wok over medium heat until fragrant (about 30 seconds), add peppercorns and fry, until almost smoking, for a further 30 seconds to 1 minute. 3. Add the sauce's remaining ingredients except the cornflour-and-water mix, and simmer until thickened slightly – about 2 minutes. Add cornflour mix slowly, until desired consistency is achieved (this will be dependent on the strength of their stove). 4. Preheat barbecue or grill pan on medium-high. Place prawns in a bowl, season, drizzle over oil, and toss to combine. Grill for 2-3 minutes, then turn over. Cook until the prawns turn opaque, red and just cooked. 5. 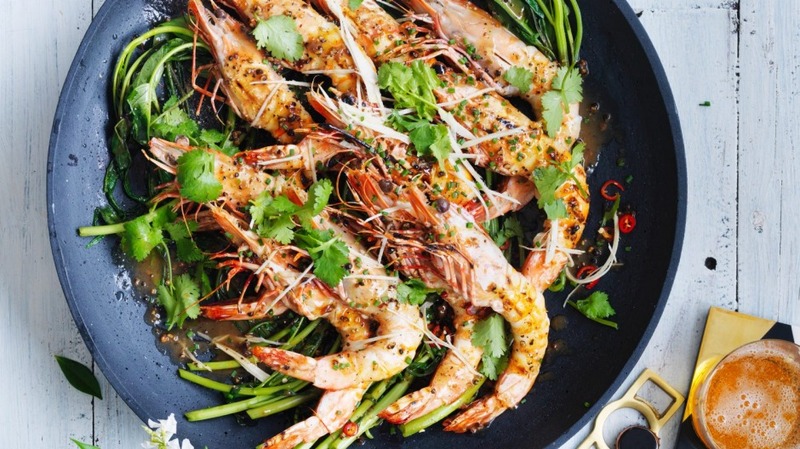 Place prawns on a large platter, top with the pepper sauce, and garnish with ginger, chives and coriander. Tip: Add a green base to this dish: stir-fry a couple of bunches of water spinach in a wok with a little oil, garlic, water, sea salt and white pepper, and top with oyster sauce and bird's-eye chilli slices.